When you just can't shake the sweet tooth, reaching for a mini cupcake instead of a full-size version can help satisfy your urge without splurging on calories. The key is to stick to just one mini. If you can't stop at just one and have several of them, you're likely to consume at least as many calories -- if not more -- than what a full-size cupcake provides. 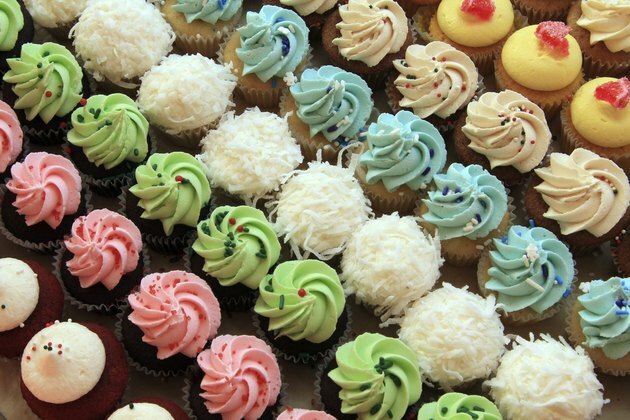 The number of calories in a miniature cupcake depends on the ingredients and exact size. If you follow one recipe for mini ginger cupcakes with cream cheese frosting from "Fine Cooking," your cupcakes will contain about 56 calories each. However, one commercial brand's mini red velvet cupcakes contain about 87 calories each. That's still much lighter than full-size versions. One cupcake chain's full-size red velvet cupcakes contain about 248 calories each.